Turn smartphone into a scanner of cellular and Wi-Fi networks! This site contains Android applications for monitoring of wireless networks. Install our applications to get more information about Wi‑Fi and cellular networks. Monitoring of wireless networks is becoming increasingly important today. This task can be easily solved by smartphones but users need to know more than just a strength level icon in the status bar. Fortunately there is a simple solution of this problem! Here you can find solutions for getting detailed information about GSM/UMTS networks. Applications on this site are designed for Android OS, with their help your smartphone will turn into laboratory for measurement of cellular network signal. 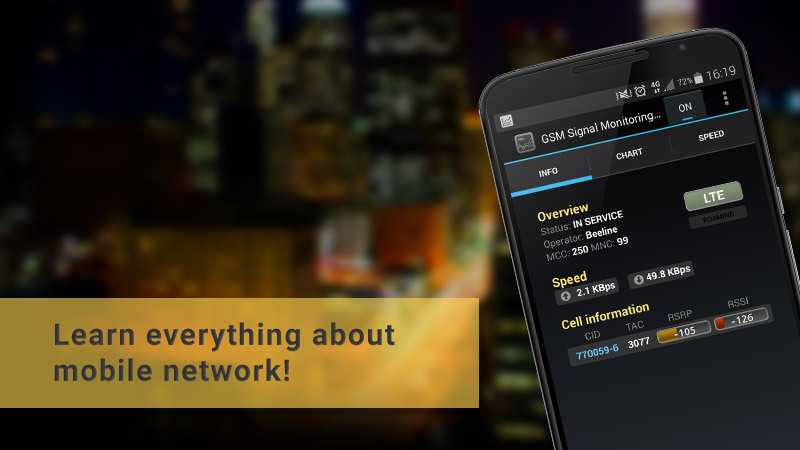 Meet Cell Signal Monitor! This is new name for the applications called GSM Signal Monitoring. Besides the name the app now has new feature: it supports Dual SIM phones! Now you can monitor two mobile operators simultaneously. Here is the full description of the app. Wi‑Fi Monitor now can scan devices in connected network. Find out who is using the same Wi‑Fi network!